Hi Folks! I really had a fun time making this card, and made quite a mess in my craft room after the stamps from FIVE different Winnie and Walter sets were put to use. Let's take a look! I wanted to create the interior of a house, with wallpaper, baseboards and wood flooring, so that the photo of the doggie and kitty friends would feel right at home. First I stamped and colored the wooden frame from Framed with Evelin T Designs. I did this a second time on copy paper so I could cut out the inside and use it as a mask. Now to start building the picture! 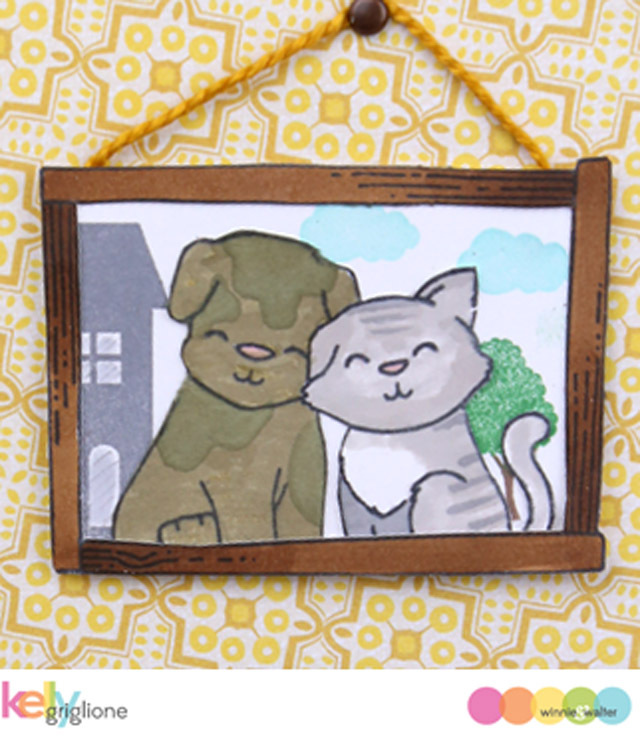 These furry friends are from one of my favorite sets from the latest Winnie & Walter release, Welcome to the Family with Evelin T Designs. I colored them with Copics, and again made a mask, this time for the dog and cat, so I could start making the background. The house, clouds and tree from Our Town are just the right size! I get so much use out of that set. The whole frame is hung on the wall with embroidery thread wrapped behind a brad. I intentionally didn't adhere the cardstock to the card, so as you open the card the photo moves a little bit. 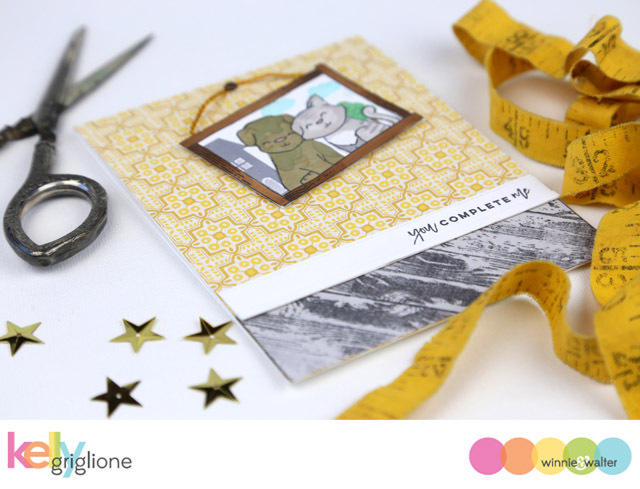 This wonderful sentiment is from another new set, appropriately named Sentimental: Love. I love this set for many reasons 1) there are a ton of different sentiments (26 to be exact); 2) the mix of script and sans serif font is just right, 3) the small size lets you sneak in a sentiment when you've already used up all the real estate on your card for your scene; and 4) there are many uncommon phrases to keep your cards fresh. This is stamped on the baseboard I made by cutting three strips of paper and layering them in the proportions of real trim. What a great scene! Wonderful use of all the different sets. 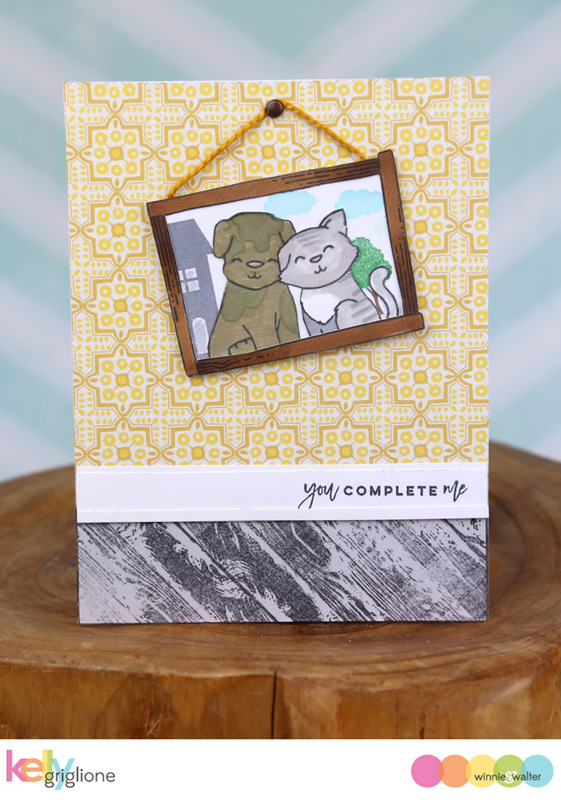 This is adorable :) I love how nicely you've mixed and matched different stamp sets. Thanks for the inspiration. This is so cue Kelly. 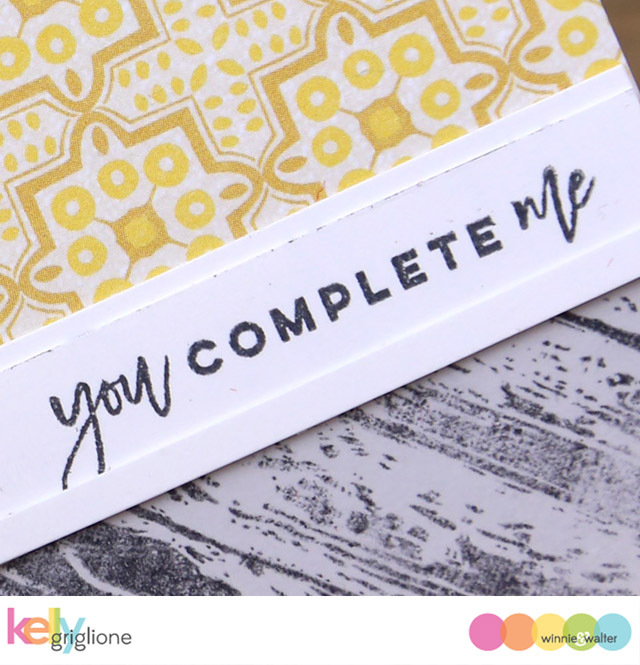 Love your trendy colored floor, Kelly & darling card! This is such a fun and creative design! Love it! This is so clever and well-thought out! Lovely card! This is so cute and clever, Kelly.